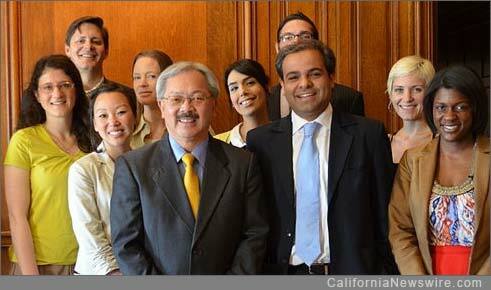 SAN FRANCISCO, Calif. /California Newswire/ — Inspired by President Obama’s call, “We’ve got to have the brightest minds to help solve our biggest challenges,” for the President’s New Management Agenda, San Francisco Mayor Ed Lee in collaboration with the White House announced the finalists of San Francisco’s Entrepreneurship-in-Residence program, the first ever program within government that helps startups develop technology-enabled products and services to address national issues of critical importance. The program has received national and global support with interest from cities and governments as far as Japan, Italy and Brazil to emulate the program. Nearly 200 startups applied from all across the U.S. – New York, San Francisco, Boston, Chicago, Washington D.C., Philadelphia, Los Angeles, Seattle, Austin were amongst the top cities – and from across the world such as London, Paris and Vienna in Europe and Tokyo, Schengen and Bangalore in Asia. Startups that applied to the program are diverse ranging from seed-stage startups to startups valued over $1 billion and are across software, hardware and services. Startups that applied include Y Combinator and TechStars companies; serial entrepreneurs who have founded billion dollar companies; NASA engineers; former employees of companies such as Twitter, Facebook, Google; Stanford and MIT PhDs; startups funded by investors such as Google Ventures and Andreessen Horowitz; and several patent holders including some that have been granted over a hundred patents. BIRDI (www.birdi.io): Birdi has created smart smoke and air quality detectors that connect you and your loved ones with timely information and alerts from indoor air quality to emergencies about a fire or exposure to carbon monoxide. COMPOLOGY (www.compology.us): Compology provides smart and data-driven waste management. They are developing a waste monitoring system which uses a wireless device to see how full and what’s inside a dumpster. The data can then be used to more efficiently manage waste hauling, recyclables and measure diversion goals. TRANSIT HERO (www.transithero.com): Arrive Labs builds software solutions for urban transit and transportation challenges. Their community-driven transit services uses crowdsourced data, predictive algorithms and intelligence to forecast urban congestion and provides transit riders with alternatives and options to optimize their transportation. BEYOND LUCID TECHNOLOGIES (www.beyondlucid.com): Beyond Lucid Technologies is an enterprise management software platform for Fire and EMS agencies. Their products enable efficient collection of medical and logistical data in the field that saves precious time, optimizes healthcare and EMS resources and better connects patients and providers. BUILDINGEYE (www.buildingeye.com): BuildingEye is building a digital platform to provide residents and businesses information about city changes such as streets repaved, sewers replaced, new buildings and all of these things that can impact the day to lives of residents and businesses and maps the city’s ongoing activities. INDOO.RS (www.indoo.rs): Indoo.rs provides a platform using mobile, localization, mapping, routing and geo-location services for indoor mapping and real-time navigation to help navigate complex environments that traditionally relies heavily on signage and static maps that are hard to interpret. Their products are built upon both the low energy Bluetooth standard and WiFi. LEVENTIS LABS (www.leventislabs.com): Leventis Labs aims to provide real time and context aware information to people at high density and traffic places. Using emerging hardware standards and software, their services deliver the information a traveler needs in his or her language at the time they need it and on mobile devices. MOBILEPD (www.gomobilepd.com): MobilePD provides police, fire, and emergency management departments with products that enable better two-way communications and engagement with their citizens. MobilePD allows citizens to be more fully engaged in public safety and enables better information sharing resulting in increased prevention and prosecution of crimes and enhancement of public safety. MOZIO (www.mozio.com): Mozio is a platform that offers transportation-related purchases and plans to improve public transit offerings and distribution channels to enable more options for passengers, riders and commuters. REGROUP (www.regroup.com): Regroup provides integrated group/mass messaging that can go out, with a single click, via email, text message, voice message, social media like Facebook and Twitter, and more including digital signage, siren, etc. It can be used for both day-to-day and emergency communications. SYTHICITY (www.synthicity.com): Synthicity uses an intuitive 3D digital city as an interactive backdrop to explore, analyze, and communicate the future of the city. A “SimCity” for real-world urbanism, it is a platform for understanding complex urban phenomena and supporting plan development as well as tracking planning through implementation such as visualizing building permits through their lifecycle. The EIR program provides direct access to government needs and opportunities, staff and their expertise, product development and ramp-up support, and mentorship from public and private sector leaders including from the White House, San Francisco and companies such as McKinsey & Company. Startups will also have access to major resources and assets, as an example, San Francisco International (SFO) Airport which gets 44 million passengers a year is offering a terminal for startups that are part of the program to pilot and test products and services. The program will start in February 2014 and run for 16 weeks through June 2014. Note: text based on press release as provided by Rahul Mewawalla.